I'm not going to pretend to be the snobby, elitist type who regularly goes to the theatre to see the latest West End or Broadway plays and then complains that the film version is a pile of soiled underpants in comparison. As much as I enjoy the theatre, I just don't get to go as much as I would like. 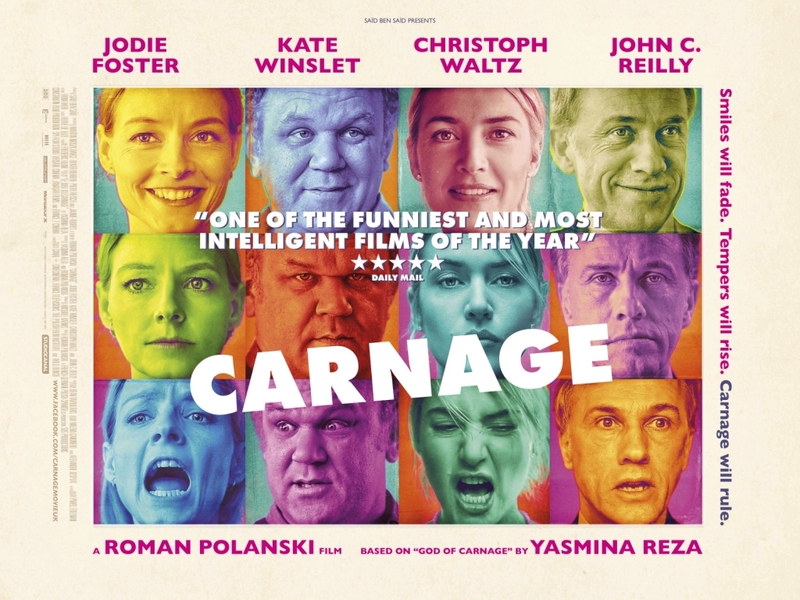 As a result, its fair to say that when I sat down to watch my rental copy of Carnage this week I wasn't too familiar with the foreign language play - God of Carnage - of which this Roman Polanski film is based. Except for the bookend title sequences, the film takes place entirely in one apartment and even if you had no idea the film was based on a play, it becomes pretty obvious very early on since it doesn't fit the normal conventions of a Hollywood movie, either in its writing, editing or the way the film is shot - not that there's anything wrong with that. In fact it makes a pleasant change to see a film that is a bit different - and this is one of the films biggest strengths (beside it's stellar cast of course). The film focuses on a meeting between two couples expertly played by Jodie Foster and John C. Reilly (the Longstreets) and Kate Winslet and Christoph Waltz (the Cowans). Considering the circumstances, it all starts so well between the two couples, who have come together to discuss the matter of a playground dispute between their two 11-year old boys which resulted in one of the boys hitting the other with a stick and knocking out two teeth. It's all very civilised and frightfully polite in the opening scene, which initially appears to be the end of the discussion between the two couples. In fact, the Cowans are on their way out of the Longstreet's apartment when the topic of discussion is changed at the door and before they know it, they have been invited back in for a cup of tea. Oh dear... they probably should have just left when they had the chance, but thankfully for the audience, they didn't and it's about to get a whole lot more entertaining for us - at the expense of the characters of course. It doesn't go completely off the rails right away thankfully; its more of a downward curve of behaviour between the couples during the course of the next 70 minutes or so. Its great to see the gradual decline in relations between the two pairs and once it really starts kicking off, things just go from bad, to worse, to excruciating. There's even internal domestic disputes between the married pairs and sometimes bonding between the two men, or between the two women, and eventually alcohol is introduced to the mix as if things weren't bad enough already. All the characters seem to hit their lowest point at different times meaning there's always someone who is completely losing it in their own way. The behaviour of the adults in the film is no doubt worse than that of their own children, and in fact it seems that the two boys apparently make-up of their own accord in the end credits anyway. Its funny because it's true. The trailer for the film didn't really sell it to me, but thankfully I don't base my viewing habits on movie trailers alone. It's pretty clear when you watch the film that the actors must have had a right good old time making it and I had a good time watching it too. Its a great way to spend 80 minutes if your looking to rent something a bit different.